Perception is a process dependent as much on sensory systems as on motor activity. This is not only because the stream of sensory inputs is organized by recurrent movements and adjustments (such as scanning, focusing, orienting, positioning) but often also because perceptual invariants are built upon correlation between sensory and motor dynamics. This double link has been investigated extensively including its influence on development. In a famous experiment in the 1960s (right) Held and Hein demonstrated that visually-guided behaviour in kittens would develop differently if inputs are the same but motor activity is different. 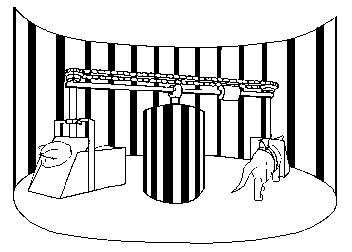 Active kittens would develop normal visual behaviour whereas passively moved kittens would not. Inspired by this work, we have explored the role of body movement in the developmental of the visual system of a mobile robot (below left). The receptive fields in this robot are developed during active or passive movement with a Hebbian learning rule. In accordance to experimental observations in kittens, the receptive fields (below right) and behaviour of the robot developed under active condition (RFa) significantly differ from those developed under passive condition (RFp) replicating the pattern of the original experiment. Suzuki, M., Floreano, D. and Di Paolo, E. A., (2005). The contributions of active body movement to visual development in evolutionary robots. Neural Networks. 18(5/6) pp. 657-666. In psychology the A-not-B error, whereby infants perseverate in reaching to the location where a toy was previously hidden after it has been moved to a new location, has been the subject of fifty years research since it was first identified by Piaget. Rachel Wood and I have investigated whether mechanisms that regulate plasticity can account for some of the observations of how this behaviour develops in infants. 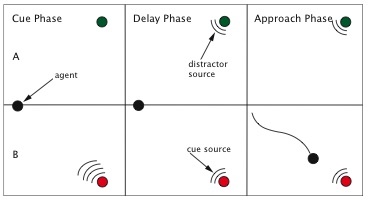 We use a minimal setting replicating the logic of the A-not-B situation using sound cues for evolved mobile agents (top right). The model demonstrates that the agents can perform the A-not-B task and that homeostatic mediation of plasticity produces perseverative error patterns similar to those observed in human infants. 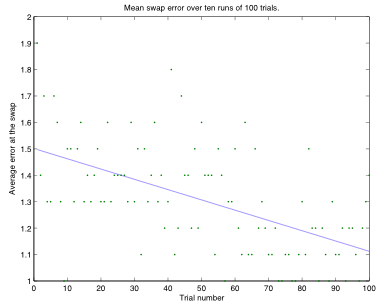 In addition, the model shows a trend for the production of perseverative errors to reduce during development (below) and, also like babies, on production of distractor patterns before the swap. A single mechanism (homeostatic regulation) is able to reproduce qualitative observations across widely varying timescales. Wood, R. and Di Paolo, E. A. (2007). New models for old questions: Evolutionary robotics and the ‘A not B’ error. In Proceedings of the 9th European Conference on Artificial life ECAL 2007. Springer-Verlag.